oday, 1 out of every 15 Black men in the United States is incarcerated. Toward the end of his life, tennis legend and activist Arthur Ashe sat down and wrote a letter to his young daughter to be read and re-read for inspiration and comforted as she got older and he wasn't around. The letter was, and is, a timeless "literary broadcast" of life lessons and love for a soon to be fatherless child. The genesis of the documentary For Our Sons is in that same vein. It is a "cinematic broadcast" of life lessons and love for the many fatherless black boys in the US who are in danger of becoming a statistic. The innovative film consists of 19 powerful and important interviews with 19 powerful and "important" Black men from different walks of life, men who have "been through the fire" of growing up Black and male in the oftentimes hostile environment of the inner city, but through strength and perseverance built for themselves their own versions of the American dream. The film employs insightful interviews, contemporary images and archival footage, the biographical life lessons of men to create a moving and engaging narrative of what it means to go from Black boyhood to black manhood in America today. Hip hop vernacular often describes life as a young black man in America as warlike. The Documentary For Our Sons is an illustration of a powerful distillation of life lessons from the POV of the veterans of this social war who have been there. Our documentary is a cinematic helping hand for the Black sons about to enter the war zone from the veteran Black sons who have been there and triumphed over society's ills on these battlefields of poverty and crime. The 86 minute DVD is $9.95! plus shipping & handling. Please share this film with Parents, Teachers, Counselors, Schools, and Universities aroud the Country. 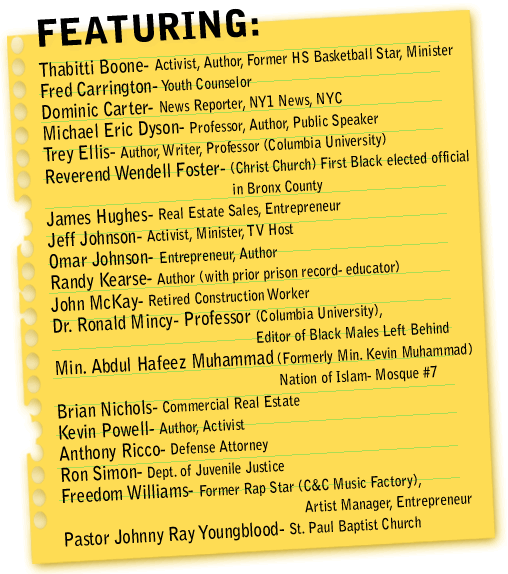 Share this film with Ex-Offenders, Social Service Providers, Civic and Religious Organizations. Most importantly, share it with our Young People! Every African American Family who has a young Black male (or female) in their lives needs to have this must see documentary, "For Our Sons" in their hands.